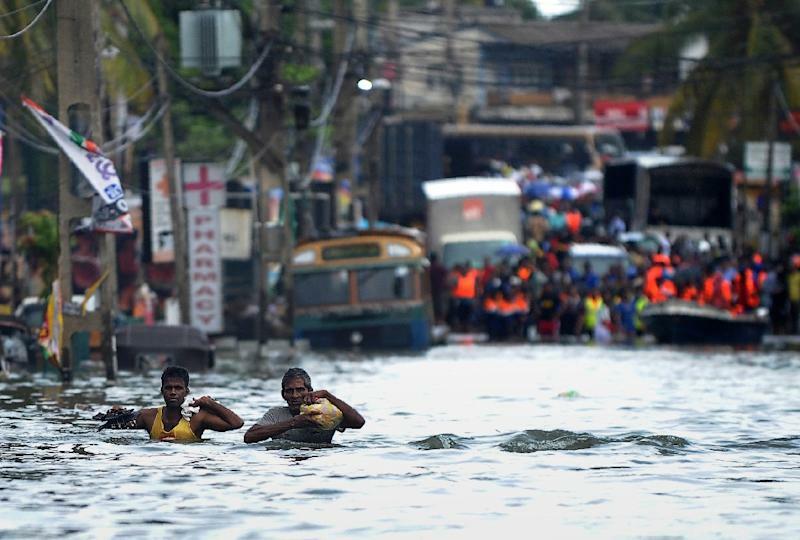 Desperate Sri Lankans clambered onto rubber dinghies and makeshift rafts Friday to escape monster floods in the capital Colombo as officials said half a million people had fled their homes across the island. The heaviest rains in a quarter of a century have pounded Sri Lanka since last weekend, triggering huge landslides that have buried some victims in up to 50 feet (15 metres) of mud. More than 60 people known to have died so far amid fears that number could spike with many more reported missing. President Maithripala Sirisena urged people to provide shelter and donate cash or food as offers of assistance came in from overseas. "We have already got some assistance from our friends in the international community," he said in a televised address. "Now I want to ask private individuals, companies and non-governmental organisations to help in anyway you can to help the victims." The national Disaster Management Centre (DMC) said 21 of Sri Lanka's 25 districts had been affected. Around 300,000 people had been moved to safe shelters while a further 200,000 were staying with friends or family. "Our information is that about half a million people have been driven out of their homes," Finance Minister Ravi Karunanayake told reporters. "The (state-owned) Insurance Corporation alone received claims against flooded cars and home appliances amounting to 1.1 billion rupees ($7.5 million). The actual loss is much, much more." Diluka Ishani, who was being looked after at a school where the military provided meals and bedding, described how her family managed to escape the floods but had lost virtually everytng. "We started moving to higher ground as the water level went up and then we found we had no other place to go to," the mother-of-two told AFP in Colombo's Kolonnawa suburb. Her family had first fled to higher ground near their home but became marooned and had to be plucked to safety on a small navy boat. "The navy saved our lives, but we lost all our belongings. The house is ruined as the water went above our roof." Private taxi hailing company PickMe added an "air lift" button to their app so that marooned users can give their coordinates to the airforce. It was not clear how many had used the free airforce lift. India said it was sending two naval ships and an aircraft loaded with emergency supplies, including medicine, tents and mobile toilets. Sri Lanka's cricket team, who are on tour in England, announced a donation of one million rupees (around $7,000) for victims and wore black armbands during the first Test at Headingley. The meteorological department says the rains have been caused by a depression in the Bay of Bengal, ahead of the arrival of the southwest monsoon. 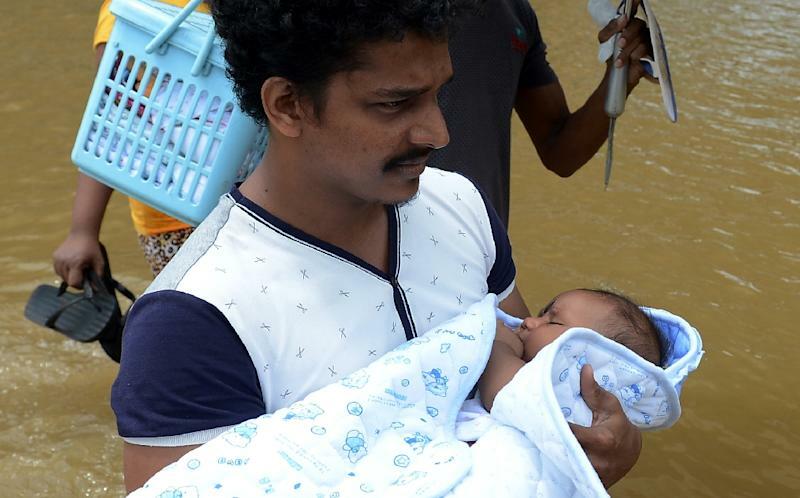 After escaping the worst of the flooding in the earlier part of the week, large swathes of Colombo had to be evacuated overnight in an operation led by the military, involving boats and helicopters. The DMC said around 200,000 people had been moved from the low-lying capital which has a population of about 650,000. The worst-hit areas were in Colombo's northeastern suburbs along the Kelani river, which began bursting its banks on Thursday evening. Residents in the Kolonnawa district built jury-rigged rafts using plastic barrels to ferry marooned residents to high ground while the navy used rubber dinghies to rescue others. Three people have been killed in flood-related incidents in Colombo but the national toll now stands at 64 dead and 29 injured. 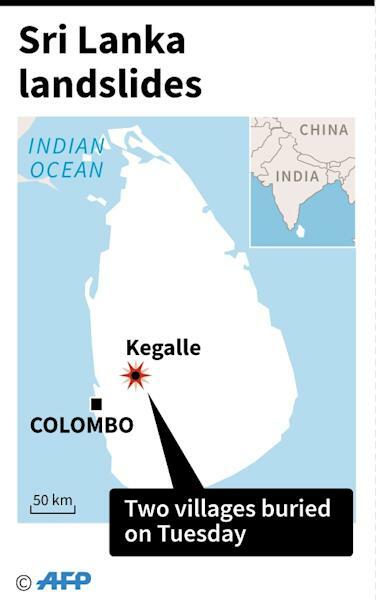 The district of Kegalle, about 100 kilometres (60 miles) northeast of Colombo, has been worst-hit, with the toll from two separate landslides rising to 34. A local police officer said 144 people, including 37 children, had been reported missing since Tuesday's landslides. "We can't definitely say if all these missing people were actually in their homes at the time of the disaster," said the officer, who asked not to be named. The officer said there was no realistic hope of finding any survivors in landslides that buried two villages in up to 50 feet (15 metres) of mud. "This is turning into a recovery operation."